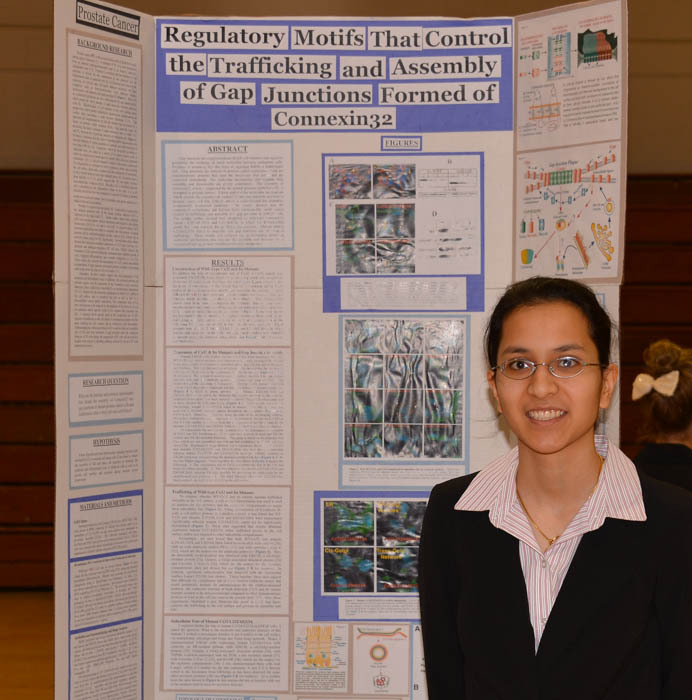 The following abstracts are from projects that won best of fair awards at GNSEF in recent years. The first observation of Xanthomonas vasicola pathovar vasculorum, commonly known as bacterial Leaf Streak being in the United States occurred in Nebraska. As of August 2016, was identified to be affecting the foliage of many types of corn. Since then the disease has been confirmed in eight other states across the corn belt, and there is still no known control method. 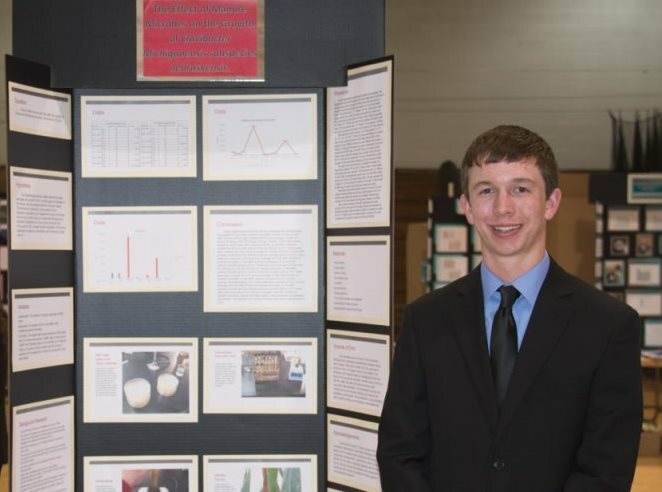 The project was chosen to see if Bacillus subtilis could be used as an environmental competitor to potentially suppress the growth of Xanthomonas vasicola pathovar vasculorum. Therefore, the question tested in this experiment is &ldquo;How will Bacillus subtilis compete with the growth of Bacterial Leaf Streak in a vivo soil study and a vitro microbiology study. Bacillus subtilis has been found to naturally compete and reduce the growth of various pathogens in agriculture through plant growth promotion, antibiosis, competition for space and nutrients, cells lysis of pathogens, and induced systematic resistance. To begin B. subtilis and Xvv. were created into soil inoculants to be used in a soil enumeration study. The procedure was conducted by placing both bacterial strains into the same environment allowing them to grow. When the bacteria were pulled out of the soil, a dilution series using selective agars were used to identify which bacteria was most populated in the soil. Kirby Bauer disk diffusion test was then conducted with the surfactin pulled from the B. subtilis to assess its effect against Xanthomonas vasicola pv. vasculorum. The initial results are currently being assessed for accurate measure and interpretation of data. Statistics are also underway to accurately analyze the data. Concussions are dangerous injuries that can have immediate as well as long term effects. They have been shown to cause dizziness, confusion, and loss of consciousness in the short term and sleep disorders, memory issues, and depression in the long term. This type of injury has become a prevalent issue today. Sports account for over 300,000 concussions per year with football, ice hockey, and lacrosse being among the chief offenders. However, there are many factors that mitigate the risk of concussion. In addition to proper protective equipment, research shows that the neck plays an important role in absorbing impact, reducing whiplash, and mitigating brain injury. It is imperative that the neck is involved before, during, and after a collision. 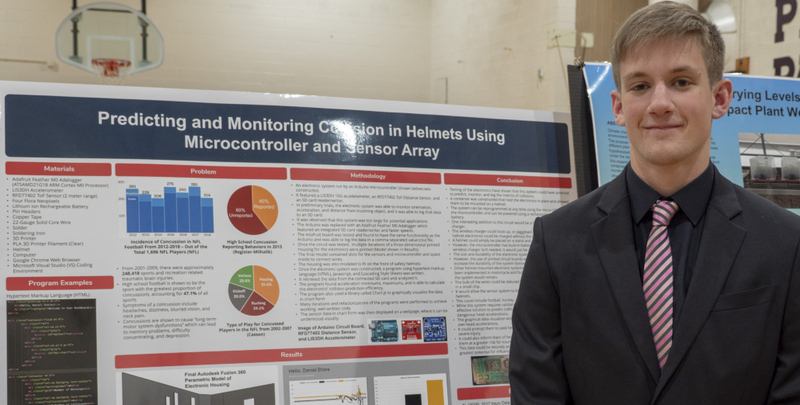 Electronics that could predict a potential impact and then use that data to warn the wearer and activate additional safety gear could reduce injury significantly. 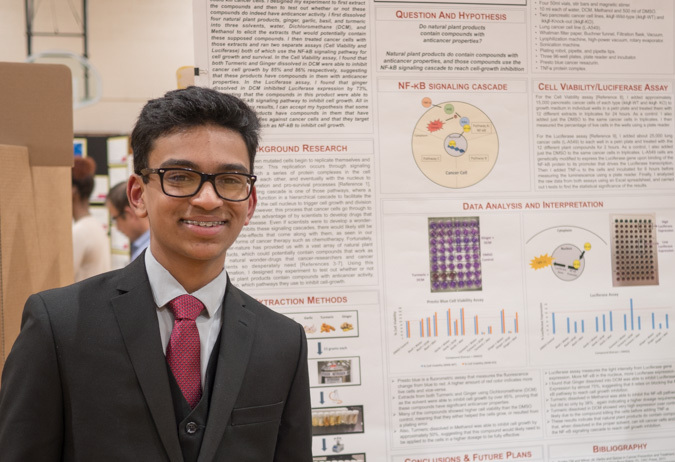 To achieve this goal, a sensor array, which included distance sensors and an accelerometer, was connected to a microcontroller that analyzed the sensor data. The system has the ability to view activity outside of the helmet to predict potential collisions, and it can also monitor the changes in head acceleration, a major predictor of brain injury. Additionally, an attached Bluetooth module allows this system to communicate wirelessly with most mobile smart devices, which could be used to alert sideline medical staff or parents of a potential brain injury. A significant amount of testing in appropriate environments is needed to validate this system however, it could reduce the threat of injury to many helmet wearers. Backgrounds: Ebola viruses cause severe hemorrhagic fever with a high mortality rate. Capable of causing large-scale epidemics, they emerge as a global security threat. Therefore, it is critical to develop effective therapeutic drugs for Ebola virus disease (EVD) to be better prepared for future crises. Currently, there are only a few experimental drugs in clinical trials for EVD. 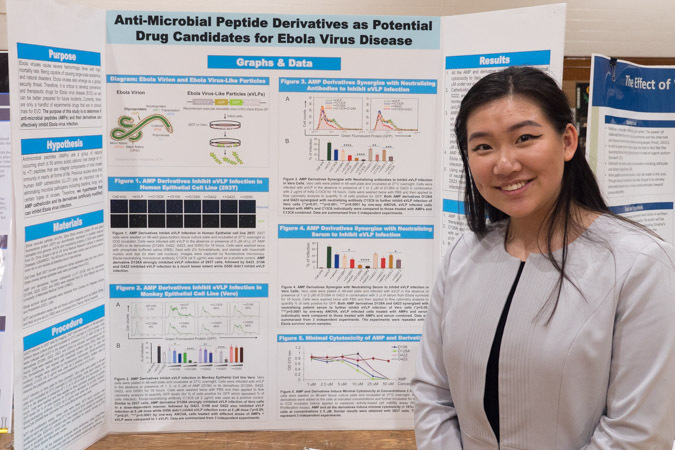 The goal of this study is to determine if the natural anti-microbial peptides (AMPs) and their derivatives can effectively inhibit Ebola virus infection. Methods: Ebola virus-like particles (eVLP) are used as an experimental “surrogate” for Ebola virus. A series of human AMPs and their derivatives are tested for their capacity to inhibit the infection of eVLP in Monkey Vero and human 293 cells. Results: Several AMP derivatives efficiently block the infection of eVLP in both monkey and human cell lines at the concentrations that do not affect cell viability and proliferation. AMP derivatives can synergize with an Ebola neutralizing antibody to further block the infection of eVLP. Using serum samples from Ebola survivors as the source of neutralizing antibodies, AMP derivatives also have similar synergistic effects in blocking the infection of eVLP. Conclusion: We identified several AMP derivatives that can effectively inhibit Ebola viral infection when used alone or in combination with viral neutralizing antibodies. Our observations need to be further validated using live Ebola virus. Because of the associated low-cost, AMP derivative peptides may potentially be an appealing new class of drug candidates for Ebola virus disease. pv. Vasculorum?” Bacillus cereus has been found to naturally produce two antibiotics, zwittermicin and kanosamine. Both antibiotics have been found to be effective antimicrobial agents.To begin Bacillus cereus and sterilized water were used to create a cloudy solution for testing purposes. The Kirby Bauer disk diffusion test and Serial dilution test were conducted to assess the interaction of Bacillus Cereus as a biological control agent against Xanthomonas vasicola pv. vasculorum. First, the Kirby Bauer disk diffusion test was performed treating filter disks already on plates of Xanthomonas vasicola pv. vasculorum with the Bacillus cereus solution and incubate the plates. The second test preformed was serial dilution test with both species of bacteria present in the solution. 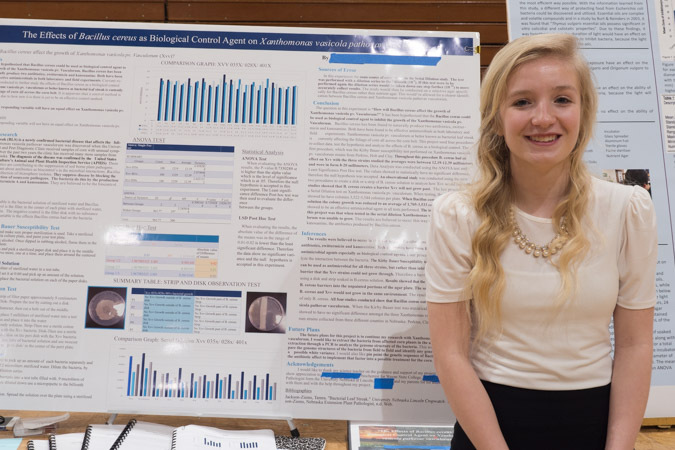 The initial results show Bacillus cereus did inhibit the growth of Xanthomonas vasicola pv. Vasculorum. Statistics are underway to accurately analyze the data. extract were able to block NF-kB signaling pathway to inhibit cell growth. All in all, I can accept my hypothesis that some natural plant products have compounds in them that have anticancer properties against lung cancer cells and that they target cancer pathways to inhibit cell growth. phytohormone application. This is because the hormones were not directly being applied to the bacteria. Experimental methods for the inhibition of growth testing included performing a Kirby-Bauer test to determine the antimicrobial properties through the identification of a zone of inhibition around a disk containing phytohormones in the petri plate. Moreover, the root colonization testing involved growing inoculated plants, applying phytohormones, and then utilizing gram staining and polymerase chain reaction/gel electrophoresis DNA analysis techniques to determine whether the roots were colonized. Literature on both Azospirillum lipoferum and Azospirillum brasilense and phytohormones was extensively reviewed prior to experimentation. However, no information was able to be located that directly related to this research. Such a finding promotes the idea this research is original and unique in design. Conclusions are yet to be drawn as data is currently being collected and analyzed. Does loss of species affect trophic function? To examine this question I estimated taxonomic diversity and trophic function for aquatic insects across streams exhibiting a gradient of habitat degradation and assigned functions to taxa present in the streams. Data were obtained for use from fourteen sites across Iowa, Nebraska, and Kansas with permission from Central Plains Center for Bio-assessment. Species loss does not necessarily indicate loss of trophic functions. The hypothesis that loss of species of aquatic insects would lead to a decrease in trophic functions was tested. Taxonomic diversity decreased with increased habitat degradation across sites. 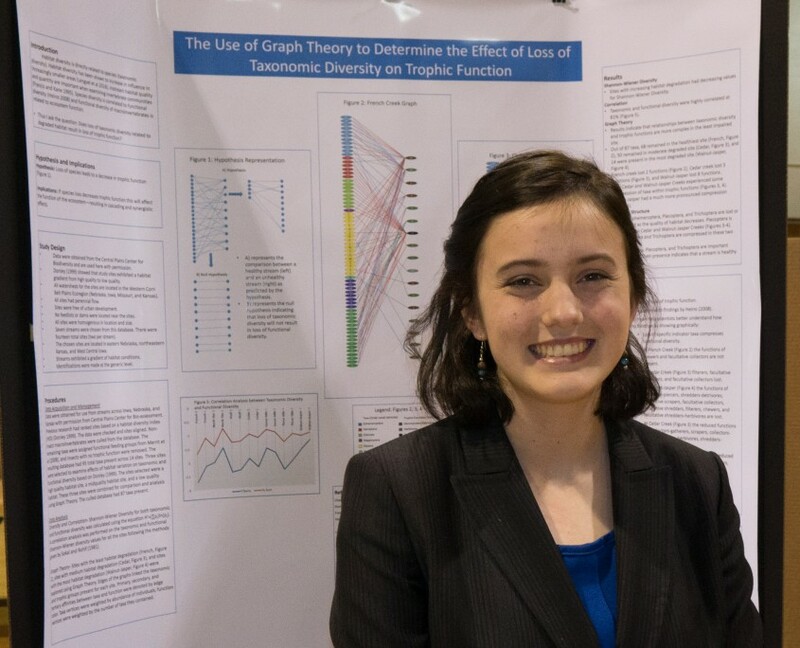 Sites with the most habitat degradation, sites with medium habitat degradation, and sites with the least habitat degradation were explored using Graph Theory. Edges linked taxonomic and trophic groups. Primary, secondary, and tertiary affinities between taxa and function were denoted by edge color. Vertices were weighted by abundance. Results indicate that relationships between taxonomic diversity and trophic functions are more complex in the least impaired site. In the most impaired site, loss of taxa led to the complete loss of some trophic functions and the compression of others. The implications of this study are that trophic function is directly affected by loss of species at least in the most habitat degraded site. Inoculation Methods with Azospirillum lipoferum and Azospirillum brasilense Promoting Germination and Growth of Zea mays. The purpose of this research is to study various methods of inoculation with Azospirillum lipoferum and Azospirillum brasilense to promote germination and growth in Zea mays. Two experimental groups are being tested, with one group containing Pioneer P1498 untreated corn seeds, and the other containing Pioneer P1498 corn seeds commercially treated with Poncho 1250 insecticide. Within these groups, smaller groups or subsets are inoculated various ways. Subset 1 is not inoculated. Subset 2 contains inoculated soil. Subset 3 contains inoculated seed. Subset 4 contains both inoculated soil and inoculated seed. In both experimental groups, Subset 1 is compared to Subset 2 and Subset 3. Subset 4 is then compared to Subset 2 and Subset 3. It is hypothesized that, in both experimental groups, Subsets 2 and 3 will have faster rates of germination than Subset 1. It is also hypothesized that, in both experimental groups, Subset 4 will have faster rates of emergence than Subsets 2 and 3. These comparisons made for a total of eight hypotheses to be tested. Three replications are being performed in order to test the hypotheses. The seeds are inoculated with a powdered inoculant, called MicroAZ-ST Dry. The soil is inoculated using a liquid inoculant, called MicroAZ-IF Liquid. Time of emergence is being observed to measure the dependent variables. As data is currently being collected, results are inconclusive at this time. This research is invaluable to agriculturists and scientists around the globe, as food production must drastically increase in the years to come. 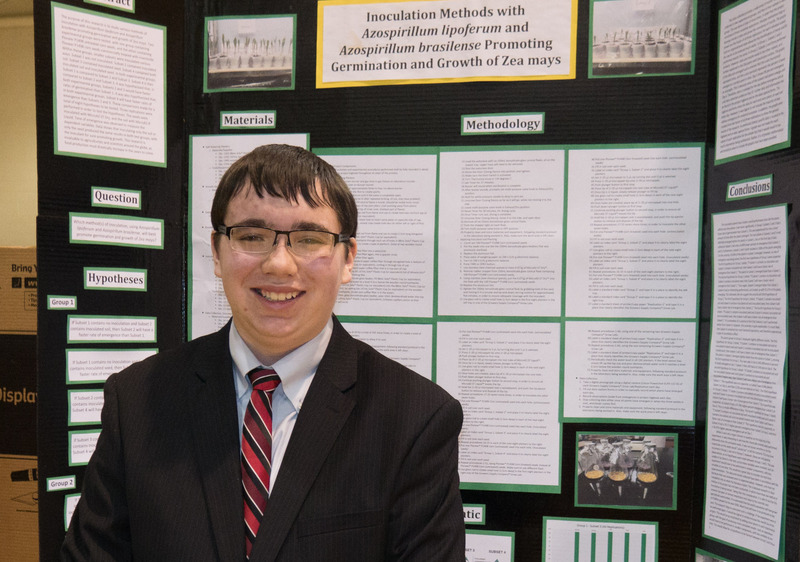 The following abstracts are from projects that won best of fair awards at GNSEF in 2015.
comparison. Currently data is being collected. dish soap, and Kocide. My data did not agree with my hypothesis. 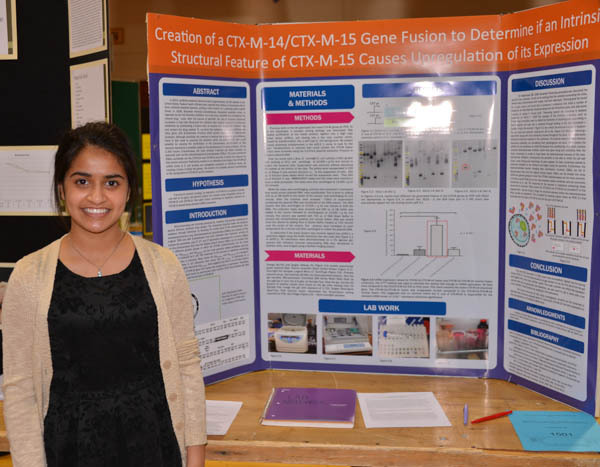 The following abstracts are from projects that won best of fair awards at GNSEF in 2014. Intro: Bacteria develop resistance to ß-lactam antibiotics by synthesizing a ß-lactamase to counteract this. It is vital to examine the genetic elements within the ß-lactamases that cause the proliferation of the B-lactamases which could be a target for the novel antibiotic. Clinically important ß-lactamases are those encoded on plasmids such as the extended-spectrum ß-lactamases (ESBLs) of which the most prominent are the CTX-M-14 and CTX-M-15 enzymes. CTX-M-15 mRNA levels in E. coli are up-regulated compared to CTX-M-14 levels. By fusion of these two genes, the location of an element causing upregulation of CTX-M-15 can be assessed. Hypothesis: The first part of the CTX-M-15 [5′ end] structural gene will contribute to a higher level of CTX-M-15 mRNA expression. Methods: Two singleplex PCRs were used to amplify the 5 half of CTX-M-15 and the 3 half of CTXM-14 (fusion). The reverse fusion was created by amplifying the 5 half of CTX-M-14 and the 3 half of CTX-M-15. These amplified products were ligated into pCR2.1 vector, subcloned into the pACYC184 vector, and transformed into a wild type E. coli. mRNA expression was evaluated by real-time reverse transcriptase PCR. Results: In, CTX-M-15/CTX-M-14 fusion, the mRNA expression was up-regulated 31-fold vs 7.5 fold for a reverse fusion, CTX-M-14/CTX-M-15. Element within the 5 end of CTX-M-15 is responsible for up-regulated mRNA levels. Conclusion: Element located within the 5 half of CTX-M-15 cause an up-regulation of mRNA levels. Further research is needed to identify the specific element in the CTX-M-15 gene that is responsible for the up-regulation. I ran a series of tests on water samples testing the overall water quality with an emphasis on high nitrate concentrations. 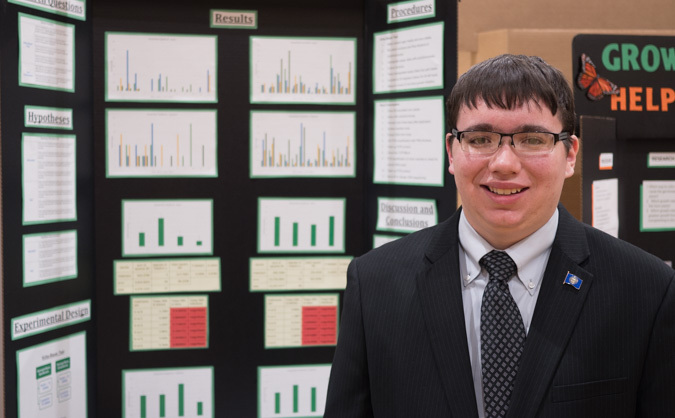 Based on studies I completed, this is continuation research involving tile drainage systems and runoff from agricultural operations and their effects on water quality. As a variable, I harvested and added Lemnaceae to holding tanks with a nitrate concentration of 150 ppm to simulate the amount of nitrates entering watersheds from the tile drainage systems. The holding tanks did include the use of an oxygen aerator to prevent anaerobic bacteria from killing my specimen. 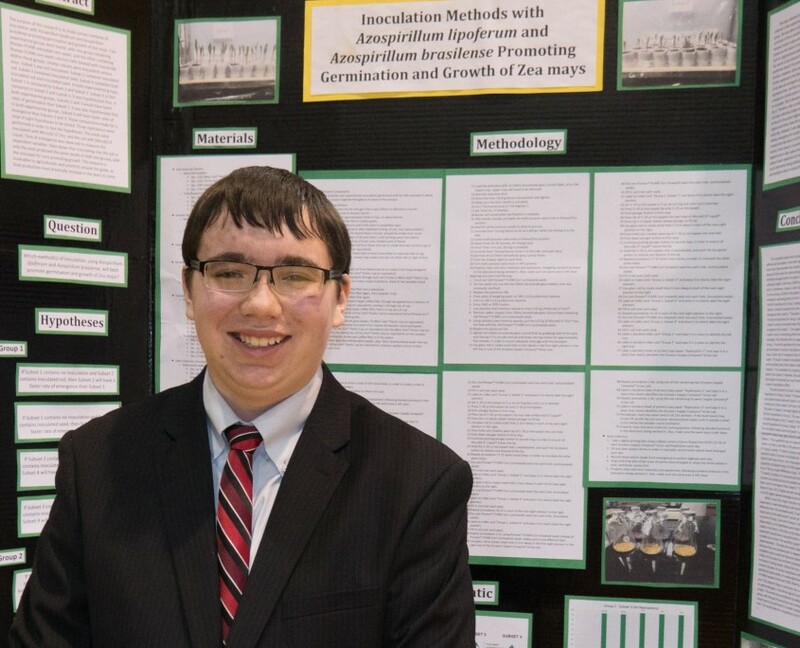 My purpose behind my experiment was to reduce the amount of nitrates in local watersheds in an environmentally friendly way, while using the Lemnaceae to study if any other overall water quality components affected by the plant. With research, I hypothesized that Lemnaceae, commonly known as duckweed, would absorb the nitrates from effected watersheds, in my case, water samples; along with vary the pH, dissolved oxygen, phosphates, and temperature. The Lemnaceae could be applied to fields for agricultural purposes acting like a residue, preventing soil erosion and naturally placing the nitrates back into the soil once decomposed. I tested the water from each tank daily with a colorimeter and studied the data for any trends that may be developing. My data consist of numerous charts that support my conclusion. I have concluded that Lemnaceae does reduce the amount of nitrates, dissolved oxygen and phosphates found in water, the pH increases, and the temperature remains consistent. 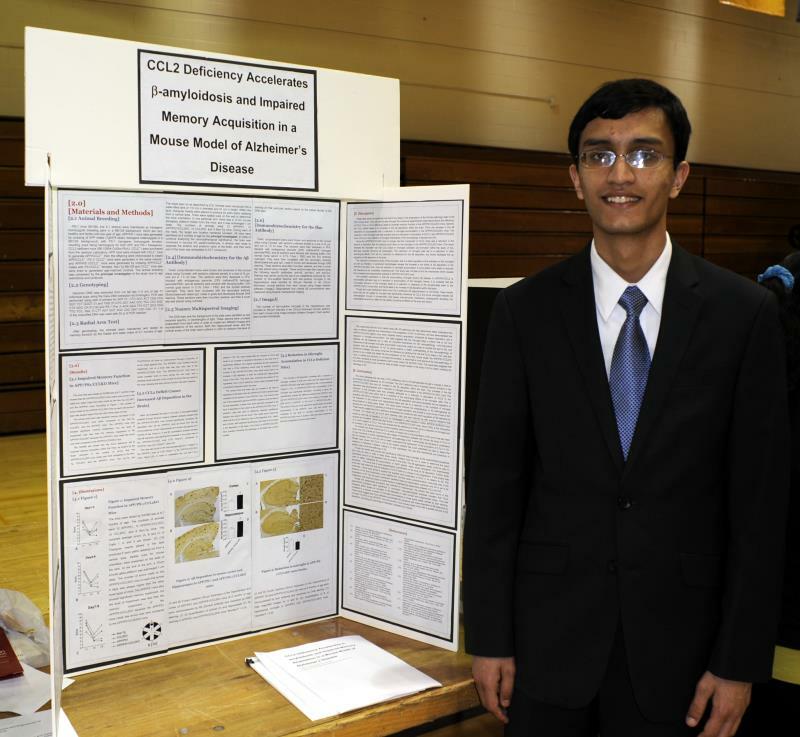 The following abstracts are from projects that won best of fair awards at GNSEF in 2013. Gap junctions are conglomerations of cell-cell channels and signal by permitting the exchange of small molecules between contiguous cells. Evidence is mounting that this form of signaling fulfills a homeostatic role. Gap junctions are formed of proteins called connexins, which are transmembrane proteins that span the membrane four times and are expressed redundantly. The molecular mechanisms that regulate their assembly and disassembly are poorly understood. The assembly of connexin32, which is expressed by the normal prostate epithelial cells, is disrupted in prostate tumors. We have explored the molecular mechanisms which regulate the assembly of connexin32 into gap junctions in a human prostate cancer cell line, LNCaP, which is connexin-null but assembles exogenously introduced connexins. Our results showed that the connexin32 cytoplasmic tail harbors three dileucine-like motifs which control its trafficking and assembly into gap junctions in LNCaP cells. Our results further showed that compared to wild-type connexin32, mutants L251A/L252A and L263A/I264, in which the dileucine-like motifs had been mutated, formed larger gap junctions, whereas mutant L212A/I213A failed to assemble into gap junctions due to impaired trafficking. These results will enhance our understanding about the molecular mechanisms that regulate the assembly and disassembly of connexin32 during prostate morphogenesis and oncogenesis. Can Lemnaceae (Lemna) be the answer to nitrate pollution in the Shell Creek Watershed? I hypothesis that Lemna can remove nitrates from the water and then become a nitrate rich cover material for fields. I ran a series of water quality tests on high nitrate concentrations that contained Lemnaceae. 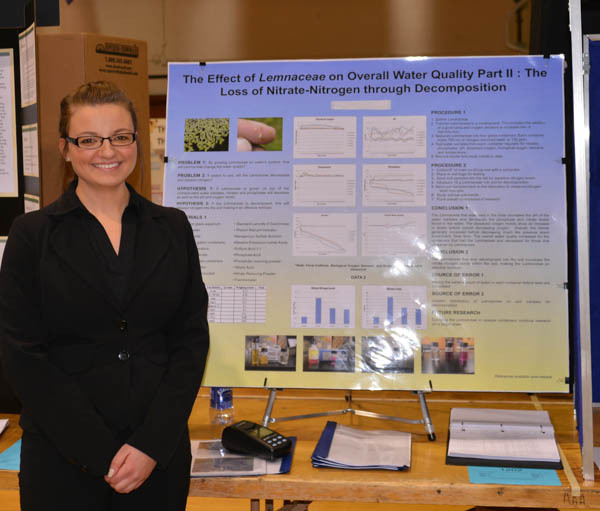 I had four holding tanks with the same amount of water, lemna, and nitrate concentrations. I had one tank without any lemna as a control. 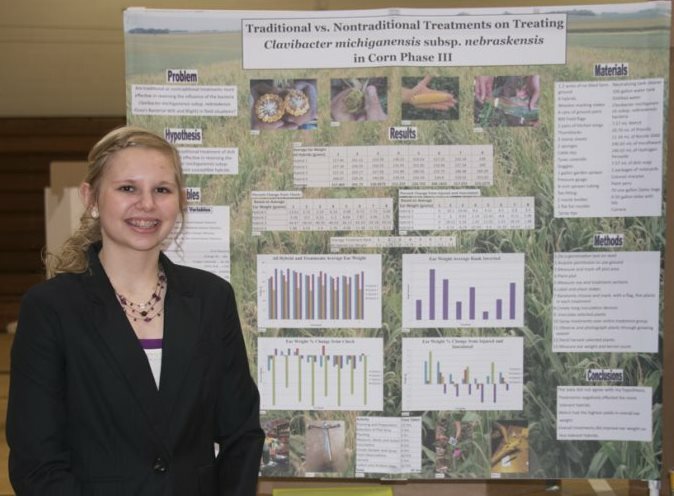 My results showed that lemna does reduce nitrate levels in water. I will further my research as a continuation project to see if the nitrate rich lemna can be used as a cover material to release these nitrates back into a field for the next crop rotation. 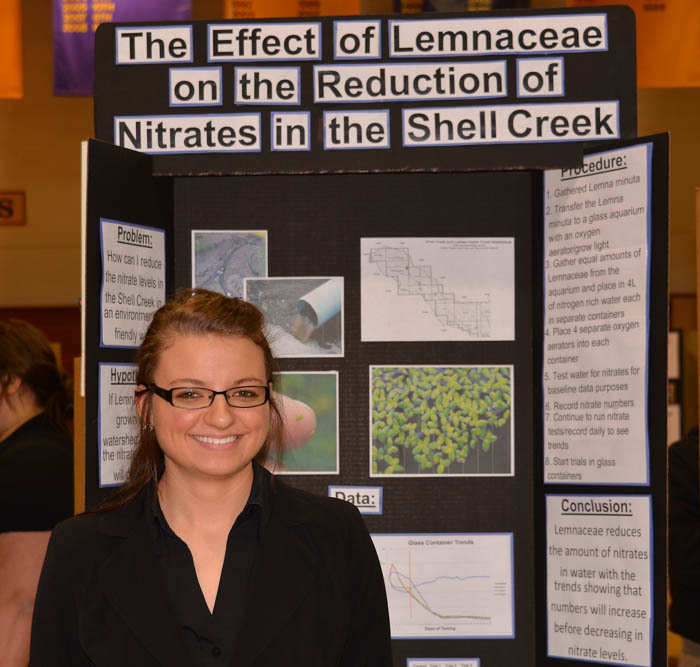 Can Lemnaceae (lemna) be the answer to nitrate pollution in the Shell Creek Watershed? I hypothesis that lemna can remove nitrates from the water and then become a nitrate rich cover material for fields. 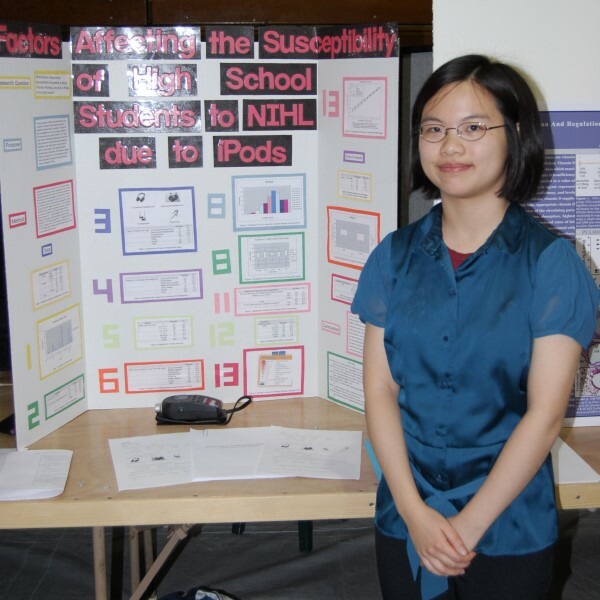 The following abstracts are from projects that won best of fair awards at GNSEF in 2012. Autism is a neural disorder that impairs social interaction and communication abilities that effects approximately 1:100 Americans. Research indicates that individuals who suffer from Autism perceive human features as inanimate (i.e. doll-like), when an unaffected individual would perceive them as animate. Our research investigates not only the tipping point of animacy, the point at which doll-like features are perceived as animate, but also the tipping point of biological motion, when a figure’s motion is perceived as animate or inanimate. After filling out a consent and Autism Quotient survey, thirty subjects were given tests that included motion perception, memory task-face-car memory, and face and object perception tests. Our investigation includes looking at whether or not how the subjects rate animacy is related to how well they remember faces and objects, how well they distinguish faces and objects, and how human motions aid human recognition. It is hoped that this study can provide us with data towards a better understanding of how to aid human communication. It is understood that pro-inflammatory molecules contribute to neuroinflammation and Alzheimer’s disease (AD) pathogenesis, but the link between certain immune pathways and their effect on AD progression is not completely understood. This study investigates the role that a CCL2, a pro-inflammatory molecule, deficiency has on memory impairment and the implications of CCL2 on the levels of microglia accumulation in the brain, the macrophages of the brain that are responsible for the immune defense of the central nervous system and the effect that this change has on Amyloid-β peptide (Aβ) deposition in the brain Aβ is one of the primary markers of Alzheimer’s disease and a marker of neurodegeneration. The Radial Arm Water Maze was used to evaluate impaired memory acquisition within the mice. These mice were sacrificed, and their cyroprotected brains were sectioned into 30 µm sections. These sections were stained via immunohistochemistry, and the Aβantibody was used to to determine the level of Aβ deposition and the Iba1 antibody was used to determine the level of microglia accumulation. Microglia cells were counted through the use of ImageJ software and Aβ cells were counted based on their optical density through Nuance Multispectral imaging. The results showed that that the CCL2 deficiency led to impaired memory function in the CCL2 deficient mice and that CCL2 deficit led to an increase in the Aβ deposition within the brain which was accompanied by a reduction in microglia levels in the CCL2 deficient mice. The reduction in the microglia cells was probably attributed to a reduction in stimulation of CCL2 in the CCL2 deficient mice leading to a reduction of the scavenging effects, or cleaning effect, of the microglia cells, thus leading to the upregulation of Aβ deposition in the brain. These results also show the potential for a better mouse model in the study of AD. This study helps enhance the understanding that pro-inflammatory cytokines have on AD and the importance that CCL2 specifically has in AD through microglia activation. 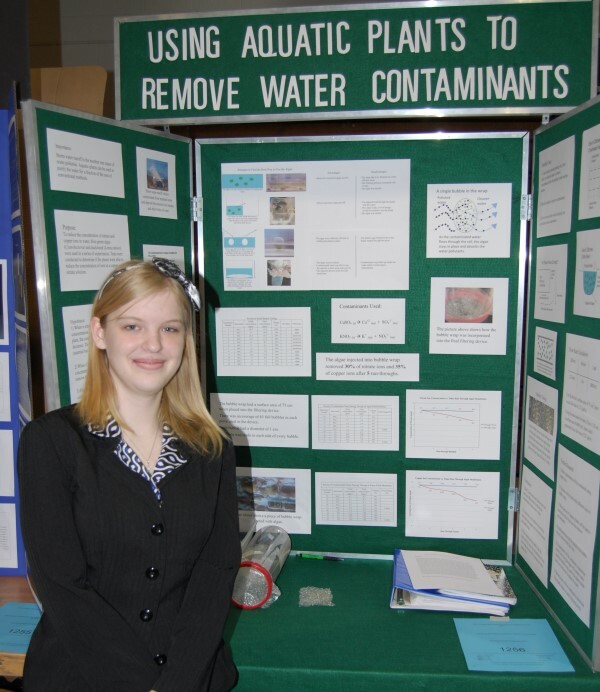 The following abstracts are from projects that won best of fair awards at GNSEF in 2011. Cyanobacteria (blue-green algae) and lemna minor (duckweed) were used to remove water containing various concentrations of nitrate and copper ions. There were two phases to the experiments. The first phase involved placing a solution of 22.3 ppm nitrate water into a beaker that contained algae and duckweed. The water was then tested with a Hach DR-2000 spectrometer to determine the concentration (and thus the percentage of reduction) after a period of time. The duckweed showed an overall reduction of 48%. The algae showed a reduction of 52%. Phase two involved injecting cyanobacteria into commercially available bubble wrap and holes were placed on both sides and mounted into a plastic tube. Solutions of nitrate and copper water were run through the system. The cyanobacteria had an overall reduction of 33%in the nitrate solution, and a reduction of 39% in the copper solution. The bubble wrap injected with cyanobacteria had a reduction of 6.6% in nitrate levels each time the solution was placed through the system. Likewise, the system removed the copper ions with a reduction of 7.8%each time the solution was run through it. Algae placed in the bubble wrap can be kept for long periods of time, as it is still viable to reduce ions even after three weeks. Also, when inside the bubble wrap, it will not leak out into the water that needs purifying. It can be moved easily to runoff sites, and will be viable regardless of the time spent in shipping, and it is not an expensive solution. The volume in which teenagers listen to their iPods is a health risk factor for noise-inducedhearing loss. This study explores this statement by answering the question: What factors influences the susceptibility of students to noise-induced hearing loss due to iPods at my high school? In order to model the student population at my high school, a survey was conducted on a sample of 260 students. The survey was stratified by grades and four classes were randomly selected from each grade using a random number generator. The survey includes questions about how loud (in dB) teenagers are listening to their music, how long teenagers are listening to their music and what listening habits contribute to their volume levels. The survey also asks for demographic information such as gender and age. In addition, a Sound Pressure Level Meter was used to measure the actual volume of the headphones that the students carry with them on the day of the survey. This survey does not test for actual hearing damage in the students. Neither does it cover populations outside my high school.From the data gathered in this survey, there was no significant difference in the listening levelsfrom grade to grade. The difference between listening levels of males and females was found to bestatistically significant. (p=0.011) Students with lower GPAs tend to listen to music at a louder level. Students in non-honors classes also listened to music at a higher volume. (p=0.0085) However, the measurements of volume levels using the Sound Level Pressure Meter do not take into account the type of headphones used. Future studies should investigate the role that the type of headphones used have on the volume levels. 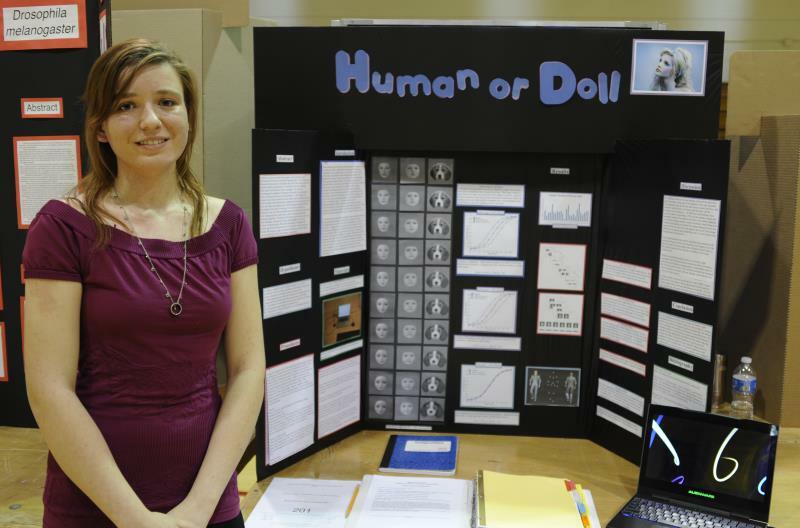 Click for more info on how to reserve space at the 2019 Greater Nebraska Science and Engineering Fair.